The latest figures from the Victorian Commission for Gambling and Liquor Regulation show gaming revenues are still below pre-GFC levels, and over half a billion short on comparison with CPI. On Friday the Victorian regulator (VCGLR) released its annual report on gaming expenditure for the previous financial year, including information and EGM numbers on pubs and clubs, but not including Crown Casino’s 2,600 machines. The State’s 26,384 machines generated $2,695,284,025 revenue in the year to 30 June 2018, up 3.29 per cent on FY17, but still below the total for 2009. Historic data of the Australian economy over the past 15 years shows CPI has averaged 2.895 per cent. The VCGLR’s data on EGM revenue over the same period shows an average annual increase of just 0.01 per cent. 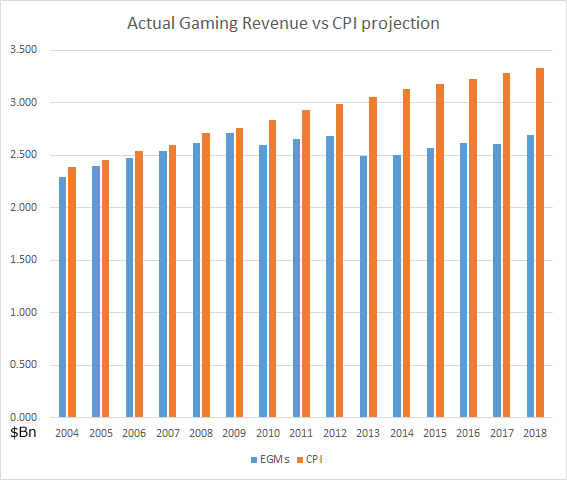 Comparing actual gaming revenue with a projection based on CPI growth, the gaming revenue is down $630 million. Publications including the ABC have criticised the Government’s so-called “addiction” to the tax revenue from gambling. The $2.7bn in pokies revenue created $1.1bn in taxes for the State, subsequently spent on universally used roads, schools and hospitals. Director of the Alliance for Gambling Reform, Tim Costello, slammed the latest figures, suggesting the Victorian Government’s decision last year to increase the terms of EGM licenses from 10 to 20 years was largely to blame, on the basis the change has given industry confidence to invest. 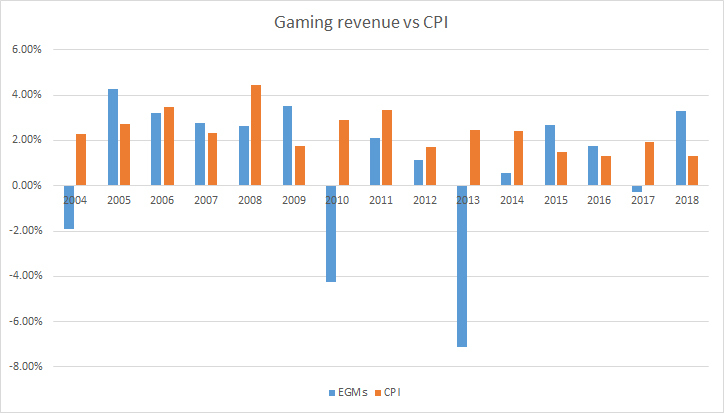 Indeed, the gaming revenue year-by-year when compared to CPI shows the worst years do not correlate with the worst-felt financial year of the global financial crisis, nor did they seem to suffer terribly in the wake of the smoking law changes in 2007. Instead, the biggest downturn did come at the time Wilkie and Xenophon were strong-arming the minority Gillard government to force untested heavy-handed restrictions, such as $1 maximum bets on all machines. The required software and hardware changes and upgrades were predicted to be very expensive and would necessitate the replacement of many of the machines well ahead of their projected lifespan. Despite no evidence ever being presented on the efficacy of $1 maximum bets, Victorian Greens leader Samantha Ratnam has renewed calls for their introduction, citing gambling reform as a key issue and strong stance for the party should the State election in November see a hung parliament.